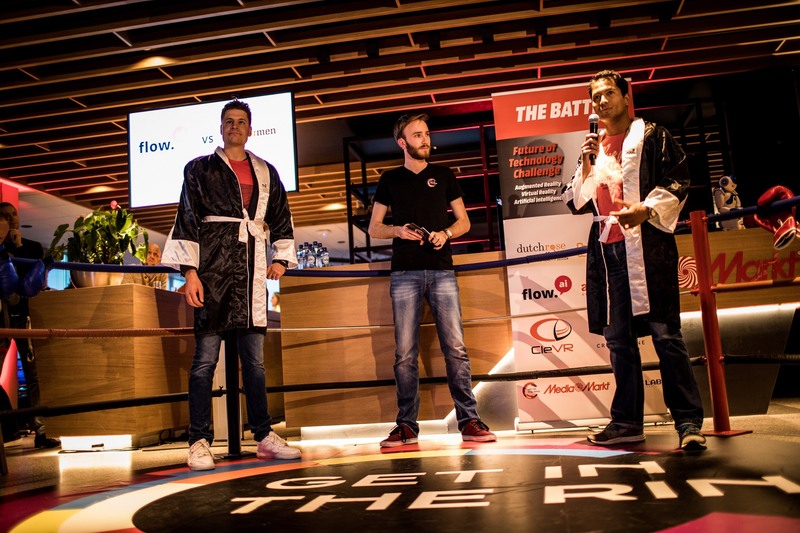 Flow.ai is the big winner of the Future Technology Challenge, organized by Media Markt and the Get in the Ring Foundation. With their use of chatbots based on artificial intelligence, Flow.ai was unanimously chosen as the startup with the best solution to optimize Media Markt’s customer experience. In addition to a pilot project at Media Markt Netherlands, Flow.ai received a wildcard for SPACELAB, the global startup accelerator of Media Markt in Munich. The challenge focused on startups engaged in augmented reality, virtual reality and artificial intelligence. Out of 42 applications, 6 startups were selected to pitch at the Media Markt HQ in Rotterdam, the Netherlands. Competing startups included Crownstone, Blippar, Anchormen, Dutch Rose Media and CleVR. We are thrilled with this opportunity. We think Media Markt is the ideal partner for us because we would like to develop a concept in which artificial intelligence and chatbots are not just used in an online environment, but also in the actual physical stores. Our top goal is customer satisfaction. With the application of Flow.ai we can improve our customer contact, provide 24/7 service and surprise customers by responding quickly and efficiently to the customer journey. By developing a concept together with Flow.ai that can also be used in stores, we want to make Artificial Intelligence a common phenomenon in retail. Media Markt is already used to closely working together with startups in both local pilots and the global SPACELAB accelerator. As could be expected, the Flow.ai pilot is not the only result of this Challenge. Media Markt is also very excited about the innovative solutions presented by Crownstone and Blippar and is discussing a collaboration with them as well. This challenge is one of the many opportunities we offer startups to stimulate innovation. We challenge startups worldwide to apply existing solutions to the innovation challenges corporations, the public sector and NGOs face and the goals they set. With these Challenges we aim to form formal partnerships, in which business is done and impact is created. Learn more about our Challenges at getinthering.co/challenges.